Cheers! I hope you’re enjoying all of my fun Christmas-y posts as of late! And today I have another one for you. 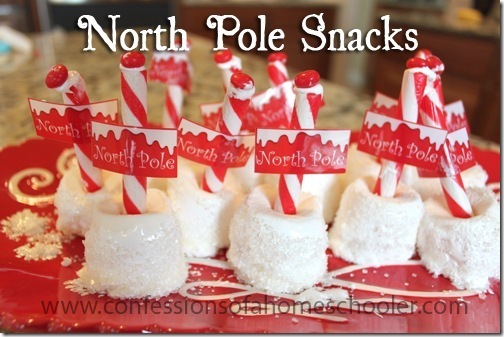 These adorable North Pole Snacks are not only easy to make, but I think they turned out super cute too. I will say that they were a little on the sweet side, but hey, it’s Christmas right? If the video doesn’t work in your browser, you can watch the North Pole Snack video here! Place your marshmallows on a plate. Spread a little more fluff ontop of the candy cane tips and add on a red hot candy to finish it off. Place finished treats in the refrigerator for a little bit so that the fluff firms back up and you’re done! And that’s it! Easy peasy! I hope you enjoyed this quick little snack, and stay tuned for more Christmas fun coming your way!